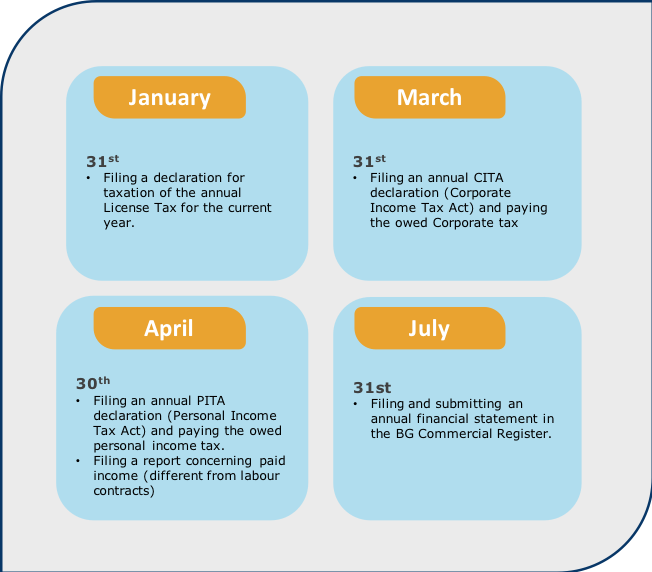 Accounting is one of the most important pillars of any successful business, therefore, we at Aidos, have decided to help you with a guide to important accounting dates to remember. We always do our best to provide you with outstanding accounting services, but we would not be able to do so without a little help from your end. To make our work flow smooth and hassle-free, we kindly ask you to check our guidelines below and insert our important accounting dates into your business calendar. On a monthly basis, there are two important accounting dates for you to know about, and basically, only one date to remember and place in your business calendar: 5th of the month! The monthly accounting deadlines are the most important ones for you to remember, but for your information and convenience, here is a list of the key accounting deadlines in Bulgaria, on a yearly basis. We, at Aidos, will make sure to inform you and remind you of any yearly accounting due dates. Don’t forget to check our Blog next month, when we will discuss the most important payroll deadlines for your company.